Internal medicine and Podiatric medicine/surgery. Burning, tingling, or numbness in the feet and toes may be diabetic peripheral neuropathy, an early warning sign of diabetes. Ignoring these symptoms for too long could lead to permanent numbness, deformities, and dry skin that cracks and won’t heal. Seeking professional medical advice is your first step in treating the pain and determining whether more serious health complications need to be addressed. Not only is diabetic peripheral neuropathy painful, it’s also dangerous. In fact, it’s a leading contributor to foot ulcers. When these open wounds become infected, amputation of the foot can follow. A physician can help you determine if your foot pain, numbness, or tingling is the result of diabetes or something else. Thyroid problems can cause these symptoms. Nutritional deficiencies, back problems, or pinched nerves could also be the culprit. But being assessed for diabetes is crucial because out of the 23 million Americans estimated to be suffering from diabetes, one in four has not yet been diagnosed. Your feet may be sounding the alarm. Medication can be used to treat any pain associated with diabetic peripheral neuropathy, but nerve damage cannot be reversed. For this reason, an early assessment is critical. If you have diabetes, a minor cut on your foot can quickly become a very serious situation. Diabetes patients are vulnerable to infections when open wounds and sores are present on the feet. 20% of diabetes patients who develop foot ulcers will require an amputation, often because of the advancement of an infection. Even more sobering, half of all people with diabetes who have a toe or foot amputated pass away within three years of the surgery. Early diagnosis and treatment of diabetes and its complications are crucial to beating the statistics—all the more reason not to ignore a strange sensation in your foot. 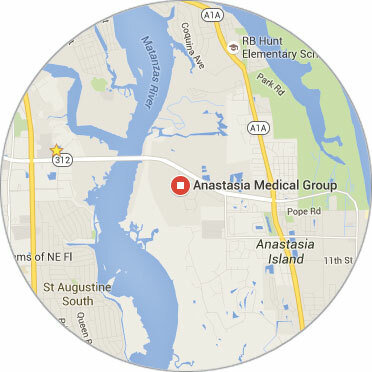 At Anastasia Medical Group, we have a team of experienced physicians and surgeons who can diagnose and treat foot problems like diabetic peripheral neuropathy on an outpatient basis. With a wealth of experience and all of the latest surgical resources on hand, we can help you determine the best treatment to get you back to living the life you enjoy. Most importantly, never ignore foot pain or strange sensations of any kind. Nerve and circulation problems can progress rapidly and are often associated with serious overall health issues. Prevention is always best, but early diagnosis is the next best thing. Our offices will be closed on Friday, April 19, 2019 in observance of Good Friday. We will resume our normal business hours on Monday, April 22, 2019. We now accept Florida Blue insurance, please contact our office for an appointment.